Free professional dog breed articles offer advice for pet owners in dog breed training, canine health, puppy care, and more. Red Setter: An Irish Breed of dog with the heart of a child. Dog Grooming. Are You Cut Out To Be A Dog Groomer! Terrier Dogs: The History of the Terrier Dog Breed. Shih-Tzu: The History Of The Shih Tzu. Spitz. Determined, Focused And Hardy. The Spitz Type Dog Is No Fool! Sighthounds. Fast, Agile And Powerful. "Step Aside For The Sight Hound Breed Of Dog!" Scenthounds. Alert, Anxious And Determined. You Can't Hide From The Scent Hounds! ScentHounds: The History of the Scent Hound. Gundog Breed. Eager, Bold And Loyal. 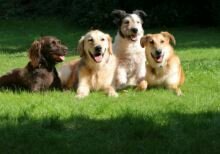 "Welcome The Sporting Gun Dog"
Herding Dog Breed. Alert, Busy And Determined. Clear The Way! Here Comes The Herding Dog"
Golden Retriever. Friendly, Reliable, Trustworthy. "Enter The Golden Retriever"
Bearded Collie. Funny, Loving, Curious, Persistent. "Make Way For The Bearded Collie"
Bearded Collie: The History of the Bearded Collie Dog. Evolution Of Dog Food. How Much Has Dog Food Evolved And At What Cost? Komondor Dog Breed. Prepare For A Challenge. The Komondor Expects To Look After You! Beagle. Lively, Active, High Energy Dog. "Step A Side, Here Comes The Beagle"
Dog Heroes: A dog breed apart. The Bond Between Dog And Owner. Do You Believe In Fate! Doberman Pinscher. History Of The Doberman - A Dog Completely Misunderstood! Dog Grooming - Do You Really Have To Groom Your Dog All The Time!